Fitness food planning refers to the process of establishing a meal plan designed to help an individual get all the kinds of nutrition that he needs to obtain a fitter and healthier body. Proper nutrition plays a vital role when it comes to achieving one’s fitness goals. This is the main reason why you should establish a food plan guaranteed to help your cells, bones and tissues receive all the nutrients that they need to support a better and healthier life. In order for you to know more about the process of creating a healthy food plan, you should consider getting a fitness foods planning certification as this supplies you with all the information that you need when it comes to keeping track of your daily nutrition needs and ensuring that your body receives its daily recommended dosage of vitamins, minerals, macronutrients and calories. One of the most useful strategies when it comes to creating a food plan designed for fitness is to include a variety of foods in moderate portions in one’s daily diet. If you are planning to become an expert in fitness food planning, then you have to improve your skills in managing the overall balance, moderation and variety in a person’s diet. A fitness foods planning course is guaranteed to instill in you the skills and knowledge needed in pinpointing areas that you can easily adjust so that these can start suiting your fitness, weight and nutritional goals. 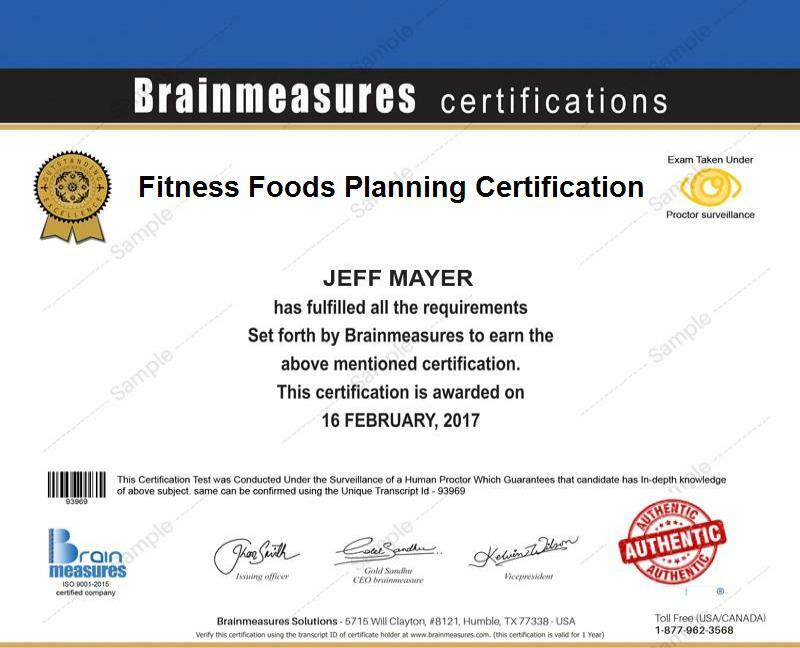 If you want to get a fitness foods planning certification, then you should know that Brainmeasures offers a platinum personal trainer package which tackles this field. This means that you can enroll in the online personal training package if you want to learn other areas of fitness including the best exercises that you can execute every day aside from getting the right nutrition. But note that Brainmeasures can also offer you the fitness foods planning certification course alone if you are serious about becoming an expert in this field. With the help of this certification course, you will no longer find it hard to detect a deficit in a specific nutrient and start adjusting it accordingly. As a trusted online certification company, expect Brainmeasures to give you the best training and learning materials for its fitness foods planning certification course. You also get the chance to undergo the most detailed fitness training guaranteed to help your body be on its top shape. A fitness test is included in the program to determine if your level of skills and knowledge is already enough and if you are already fully aware about the things that you can do to outline highly nutritious meal plans every day. You can get your certificate after you successfully hurdle the fitness foods exam. The fitness foods planning certification program from Brainmeasures targets a wide array of individuals especially those who are aiming to make some positive changes in the way their body looks. The certification course is more suitable for fitness, medical and health professionals whose responsibilities include helping active individuals and athletes to obtain a better understanding about the role of nutrition when it comes to getting the most out of their exercises. A lot of individuals, professionals and businesses in the fitness industry are in need of the most effective fitness foods planning experts to effectively carry out whatever purpose that they have for wanting to establish the best diet, foods or menu plans. This gives fitness foods planning certification holders the chance to receive decent offers when it comes to their salary. At present, the average annual salary that you can get after you receive your fitness foods planning certification is $66,000 and this will increase as you gain more years of experience in the field.